Once upon a time in the car business, it seemed Japan could do no wrong and America could do almost nothing right. America's Big Three carmakers figured if you can't beat 'em, join 'em. So they partnered up with their Japanese competitors and built vehicles here using much of the same engineering that had given Japan an edge. The Mercury Villager is a product of just such a partnership. 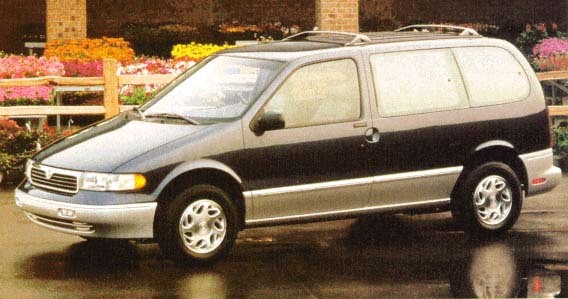 Introduced in 1992, the front-wheel drive Villager gets its drivetrain and most of its design from Nissan, and shares both with the nearly identical Nissan Quest. Powertrains come from Nissan, and assembly is handled at a Ford factory located in Avon Lake, Ohio. The Villager arrived as a more carlike, more compact yet surprisingly spacious alternative to Chrysler's then-aging minivan trio. In fact, it represented the first true challenge to the original Chrysler minivan concept–car-like driveability and van-like cargo capacity, plus garageability. Early responses from Ford and GM were based on rear-drive truck platforms, and GM's front-drive Chevrolet Lumina APV, Pontiac Trans Sport and Oldsmobile Silhouette never quite caught on. In addition to nailing the concept, the Villager and Quest were affordable, with pricing that started at about $17,000. The Villager is still pleasantly carlike and spacious for its size, and gets a host of upgrades for 1996. And at $19,940 to start, it's still affordable. But with larger, newer minivans at a comparable price from Chrysler and even Ford, the Villager also shows how much the world around it has changed. Revised taillights, a new flying M grille and color-keyed side moldings are the major changes outside for 1996. Otherwise, the Mercury Villager's rounded shape is unchanged, and still looks fresh, even when it's parked next to a Dodge Caravan or a Honda Odyssey. While the Villager is nearly 20 cu. ft. smaller inside than Chrysler's short-wheelbase vans, it's also 24 cu. ft. roomier than the dimunitive Honda. And at less than 1 in. longer, it's as easy to park. Once you finish parking, however, the Villager provides rear- and center-seat passengers with just one side door versus the option of two sliding doors on Chrysler's vans and two sedan-style doors on the Odyssey and Mazda MPV, which include them as standard equipment. The good news: The Honda costs nearly $4000 more, and comes only with a 4-cyl. engine while Villagers and Quests get a smooth V6. Villagers come in three models: GS, LS and the topmost Nautica–a $26,390 luxury edition that includes an attractive 2-tone paint scheme, aluminum alloy wheels and leather interior trim. There's also a van version ($19,385), intended for commercial hauling. But even the $19,940 Villager GS comes with such niceties as standard antilock brakes, an AM/FM/cassette sound system and intermittent wipers front and rear. You can also save a bundle over the $24,300 LS by ordering the GS with Preferred Equipment Package 692A. It includes power locks, windows and mirrors, auxiliary center-seat climate controls and virtually everything else that goes with the LS version for about $1800 less. A second airbag, adjustable-height front shoulder harnesses and larger gauges are the big news inside, bringing it up to date in terms of standard safety features. The rest of Villager's interior is mostly unchanged. That's good in some ways; in others, this is yet another area where the rest of the world has moved on. Lots of space and nearly limitless ways to use it are still the Villager's strong suits. Seating in the 5-passenger GS includes two highly supportive front buckets and a rear bench with a back that reclines and folds forward into a picnic table. While you can't remove the bench, you can trim the space it takes by tilting its bottom cushion up and sliding the whole thing nearly 50 in. forward or back, depending on where you need the room. You can also make the GS a 7-passenger van like the LS and Nautica by adding a 2-passenger center bench–a $330 option included in Package 692A. While it won't slide or recline, the center bench does everything else the rear bench does. It's also removable. Unfortunately, doing so requires two strong bodies. It also entails folding the seatbottom, tugging on a series of levers and then dragging the heavy bench through the Villager's single side door. Compare that to the slick new seats in Chrysler's minivans, which you can roll back to the tailgate or carry out either side door. Optional center captain's chairs ($610) are more manageable and versatile, since they're lighter and can be removed one at a time. The bad news: They come only on uplevel models. And unless the center seatbacks are folded, rearmost passengers will find kneeroom tight with either seating arrangement. The Villager was arguably the world's best-handling minivan when it came out, and it's still at the front of the pack. Our test GS benefitted from wider all-season performance tires that come with Package 692A, along with stiffer shocks and a rear stabilizer bar included with the $85 uplevel suspension. The result is a minivan that hugs snaking backroads and keeps its cool during emergency maneuvers better than any save Chrysler's. Villagers with the uplevel suspension also ride firmly yet comfortably, despite carriage-style leaf springs and a beam axle in back. Stops are also short and unspectacular, despite rear drums instead of the discs on such newer competitors as Ford's Windstar. Villager's Nissan-built V6 is another strong point. While it's smaller and less potent than the ones available in Chrysler vans–let alone the 200-hp V6 offered in this year's Windstar–canted valves and overhead camshafts help it move this small van briskly, smoothly and quietly. We also found the electronically-controlled 4-speed automatic transmission to be both smooth and responsive. Like most of Ford's other automatics, its column shifter includes a handy button at the end of the lever for locking out overdrive to provide a little extra oomph for passing or going up steep hills. Extended drives also revealed some interior details that haven't stood the test of time. Flush-mounted switches that are hard to find and tough to tell apart are our biggest gripe. Examples include feel-alike buttons for the optional power driver's seat and rear wiper and washer. You have to look at them to use them, which is out of step with the new age of tactile differentiation in switches and other secondary controls. Climate control dials are mounted above the more frequently used radio controls, and both require a long reach to the center. You'll also find the small buttons for the climate modes hard to find while moving. One set of switches that has improved are the larger tabs and beefier buttons for the radio. And as always, Villagers offer separate controls for climate as well as audio volume and tuning for center-seat passengers. Parents take note: You can lock out those audio controls from up front. Who says we've lost control of our kids? As partnerships go, the Villager-Quest alliance has to be rated as a major success. It gave Nissan its first viable vehicle in this class after two previous unsuccesful attempts. It also gave Mercury not only its first minivan, but the first of any Chrysler-challengers that really rode and handled like a sedan. GM attempted to do so earlier, but its first shot at this target didn't quite reach the bullseye. Unfortunately, the minivans that have arrived since have proven that American manufacturers can do at least as well on their own–better, in some cases–and do it for less. If it's space and ride you want, Ford's Windstar delivers more of both for the same price. While the Windstar can't quite match the Villager's handling and sport-sedan feel, all three Chrysler vans are definitely in the ballpark. More space and added features–including an optional fourth door–are a likely part of the next-generation Villager that's due for 1998. Then again, if sheer space and high power numbers were everything, Honda's nimble new Odyssey wouldn't exist. Like the Honda, Mercury's Villager is for buyers who want a minivan that can carry a small bus-load of people and cargo some of the time without feeling like a bus all the time. That, and nifty styling, is its saving grace.